Ireland has always been famous for her glovemen - men who pitted logic, strength and stamina against men of other nations on the world's canvas stage. Some even became Olympic medal winners. John McNally was just one of these fighters but unlike the many who followed in his footsteps to find fame and fortune his name is now largely forgotten except to the real boxing aficionado. John McNally won silver in the Olympic Games held in Helsinki in 1952 - a remarkable achievement for any man - but he was also the first Irishman to win an Olympic medal for boxing. Many believe that the medal he should have been awarded was gold and the phrase 'we was robbed' could have been coined with John in mind. 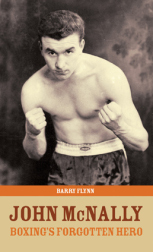 This is the story of a boxer who fought against overwhelming odds to escape the mean streets of Belfast to reach the heights of his sport.